News Flash: The e-book of Changer is on sale today through May 2 for 99 cents. JANE: Last week, I mentioned that I had a theory as to why Diana Wynne Jones did so much with parallel universes. I should have added that I think her gift for magic that works oddly, and with, in general, a logic that doesn’t fit the usual, may be owed to the same source. Would you like to hear my theory? JANE: Several weeks ago, as I mentioned at the time, I read Diana Wynne Jones’ novella, The Game. I always read the jacket copy and author biographical material. Here, for the first time, I came across a bit of information I had not known before. Diana Wynne Jones was dyslexic. The jacket copy mentions that she knew she wanted to write stories from the time she was eight, but it took her until she was twelve to figure out how to work around her dyslexia so she could do so. Now, from my adult perspective, four years doesn’t seem much, but put it in terms of her life to that point! Four years is a third of her life! Amazing determination. ALAN: That’s incredible – what a strong will she must have had. Being me, I decided to put on my researcher hat and see if I could get confirmation for my theory. I was handed off by various friendly people (Sharyn November suggested I talk to Neil Gaiman, Neil connected me to Tom Abba who went to Dr. Butler). After talking with Dr. Butler, Tom Abba sent me the following section of an interview by Dr. Butler of Diana Wynne Jones as printed in Reflections on the Magic of Writing, an autobiographical work by Diana Wynne Jones. CB: I know you’re dyslexic and left-handed, and in both those ways you’re coming at things from a slightly unusual angle, and I wonder if you feel that has had any relevance to the way you see and therefore write about the world? DWJ: It probably has, but the trouble is you see that it’s normal for me. All it is is a struggle to try and keep level with right-handed ways of going on. I wouldn’t know about that, because the way I see things is, to me, normal. But I think you’re probably right and I think it probably does. CB: I was thinking of that part in The Merlin Conspiracy where it turns out that Grundo’s magic is at ninety degrees to the magic of the universe he lives in. DWJ: Yes, he does everything back to front. Yes, that was the bit where I thought, well, there are quite a lot of people who are dyslexic: let’s give them a champion, as it were. One thing it’s very good for, actually, being dyslexic, is solving anagrams. It ought to make me a past master at Scrabble, but it doesn’t – but I’m very good at anagrams in crosswords, because I think my brain stores things scrambled as opposed to ordinary brains. CB: The unscrambling muscles must be quite well developed. DWJ: I think they are, yes. Though I did fail a driving test purely through dyslexia, because every time he told me to turn right I turned left. And we got lost. The examiner was furious, seething, and he failed me on the spot. Which was reasonable, of course. Goodness knows where we ended up. It was a completely strange part of Oxford to me, and obviously to the examiner as well. He couldn’t wait to get out of the car when we finally worked our way back to civilization. ALAN: Reflections on the Magic of Writing is an autobiography, cobbled together after Diana Wynne Jones died, and made up of various articles and speeches that she published during her life. By its very nature, it is a little repetitive (she said similar things in many speeches), but it paints a fascinating picture of her development as both a person and a writer. I recommend it very highly. JANE: Thanks for the recommendation. I’m definitely going to look for it. Was there anything in it you found particularly interesting or insightful? JANE: Skinflint, self-centered adult characters who think they are kind and generous are a recurring motif in Diana Wynne Jones’ works. One who springs to mind immediately for me is Duffy in Dogsbody. Kathleen finally tells Duffy off, quite eloquently. I wonder if the author was letting loose a life-long desire? Were there other anecdotes you found interesting? ALAN: Actually, there was an interesting sequel related to Arthur Ransome. During the war, Diana and her siblings were evacuated to the Lake District where the Swallows and Amazons books are set. Arthur Ransome lived nearby and became very annoyed at the noise the children made while they were playing and he stormed into the house to complain. This was how Diana first learned that writers were actually real people. It was a little bit of a shock to her. She also met Beatrix Potter, of Peter Rabbit fame. Diana records that Ms Potter was a crotchety old woman who smacked Diana’s sister for swinging on her front gate. JANE: She must have been convinced that all writers are permanently bad-tempered. ALAN: You mean they aren’t? JANE: Ahem! Pray continue while I go find my sledgehammer so I can bludgeon you! 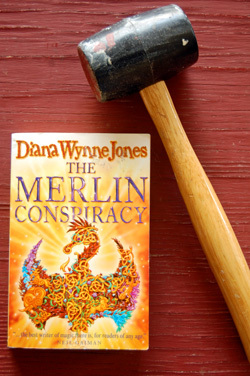 ALAN: When Diana Wynne Jones died, she left behind an incomplete novel. It was called The Islands of Chaldea. Her sister Ursula Jones couldn’t bear to leave it unfinished and even though she’d never done anything like it before, she decided to complete it on her sister’s behalf. It was published in 2014. When I started to write, it came easily. It was almost as if Diana were at my elbow, prompting, prodding, turning sentences around, working alongside – and then it was finished, and she was gone again. I’ve read (and loved) the novel, and trust me, you simply cannot see the joins. Ursula did a wonderful job of channeling her sister. I have no idea what this means in terms of the nature versus nurture debate as to whether writers are born or made. But I’m sure it must mean something. JANE: I’ll need to read it and see if I agree… But I’m so glad that writing it was a happy experience for Ursula. Now I think we should probably stop nattering about her words and turn our readers loose to enjoy the works of this wonderful writer! This entry was posted on April 30, 2015 at 1:00 am and is filed under Thursday Tangents. You can follow any responses to this entry through the RSS 2.0 feed. You can leave a response, or trackback from your own site. I read one of those, about H.P. Lovecraft, based on his voluminous surviving correspondence. Do you think such things are good autobiographies? Or merely biographies (with the biographers’ own motivations) with better-than-average source material? After finishing the Lovecraft one, I wondered what ELSE was in his letters that the person doing the book had left out. They don’t necessarily make good autobiographies — letters are often dull. But they are an excellent source for good biographies. Let the biographer wade through the boring bits and distil out the pearls of wisdom (if that’s not too much of a mixed metaphor). Hmm. You’re both right-handed? Speaking as a leftie, I’m not sure it’s quite the issue. For me, living in a right-handed world is normal. Basically, the world’s not set up for my convenience, and furthermore, no one really cares. Indeed, if I set it up to suit my leftist preferences (something I rarely do now), a right-winger who comes along complains bitterly about how how uncomfortable my reality is, how they just can’t make it work right, and often they’ll make a great fuss about switching everything around to suit them. I’ve gotten used to navigating a right-handed reality, so it’s much less of a fuss to me. There’s a certain amount of schadenfreude in watching a right-handed person who’s deprived of the use of their right hand. They’re far more crippled than I am when I can’t use my left hand. Unfortunately, our world coddles such asymmetric skill development, and forces people who are stuck being different to deal. Here’s the thing: left-handed existence isn’t about being sinister or backwards, it’s about being ambidextrous, although ambisinistrous is really the term we should use. * After all, most people who are even partially ambidextrous have been forced into that situation by being left-handed in a right-handed world. We don’t want two weak right hands, we want two strong left hands like we’re used to, but there’s still this bias that anyone who can use both hands has “two right hands.” I suspect this bias is why some left-handers get in the habit of being outsiders, seeing things differently. This doesn’t always happen, though. AFAIK, there have been a lot of left-handed US presidents. Growing up left-handed can make some people very determined and adaptable. As for getting lost with directions, I suspect that’s a different issue. I know a couple of very right-handed people who can’t tell right from left without thinking about it. I used to have that problem too, but I got grumpy about it and practiced until it wasn’t an issue any more. There’s not really a word for map-skills like there is for literacy and numeracy, but I think that it’s a separate set of skills, and it takes some real practice to interpret maps and directions into reality. *dexter is right, sinister is left, at least if you speak Latin. It has to do with how you properly drape a toga, among other things. I think I share Jay M.’s definition of biographies, and they are not collections of letters and interviews. But, while not complete biographies, some of these collections are fascinating – “The John W. Campbell, Jr., Letters, Volume 1,” for example (although I haven’t seen any followup volumes), and “Yours, Isaac Asimov,” assembled by his brother, and “Grumbles from the Grave,” put together by Robert Heinlein’s wife. All interesting reads. As someone who has written a biography — on Roger Zelazny, for Twayne press, many years ago now — I can say that any piece written about a person contains editorial decisions. In the case of the DWJones book, there may actually be a value to this because the collected essays included were written by her with no sense that she was writing to try to provide a comprehensive picture of her life, just dealing with the issue at hand. I once listened to a husband and wife heatedly discuss just which trip they took with just which people. They disagreed as to date and destination. To me this pointed out that biography has the advantage that the writer has more than memory backing up statements.